Usually what locals want most from driving over the Yaquina Bay Bridge is to get over it quickly. We mutter at tourists who take their time, gawking at the ocean to the west and the bay to the east. Yeah, yeah, it’s pretty, but move along. Some days it’s so foggy you can’t see anything on either side. Other days, it’s so windy, you’re just trying to stay in your lane. And on other more benevolent days when the sun shines, and you see hills in the distance and sailboats bobbing in the bay, you think, I’m so lucky to live here. Yesterday, Sunday, Oct. 3, the scene on the bridge was different. The people of Newport and surrounding towns turned out en masse—and on foot—to celebrate the bridge’s 75th anniversary. 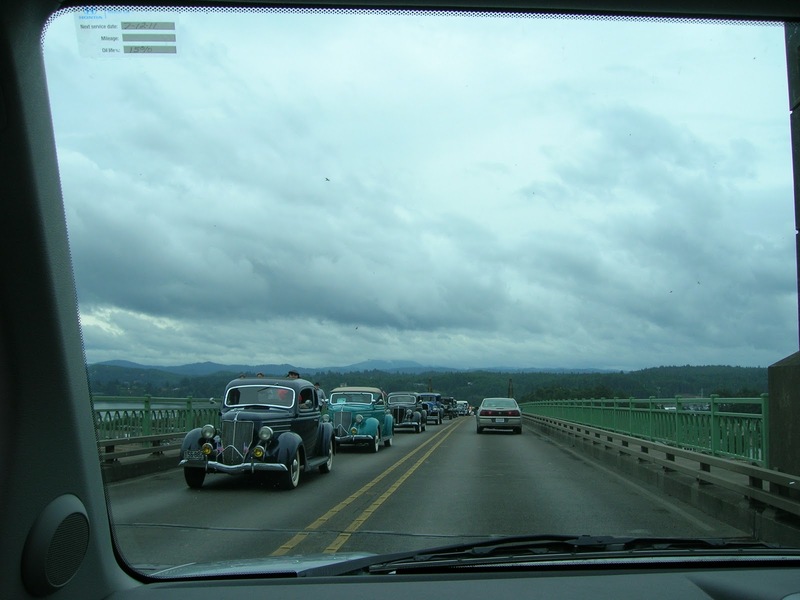 Our art deco masterpiece opened in 1936, part of a chain of bridges by architect Conde McCullough that finally provided a way for people to drive the Oregon Coast without having take a ferry across the waterways. It really is a beautiful bridge, painted a soft green, its arches swirling into the sky, its pillars artful reminders of an earlier time when life moved more slowly and nobody was tempted to use a cell phone while speeding across the bridge. The celebration has been going on for a month, with talks, displays in the historical museums, and big banners across the bridge and in front of Newport City Hall. Two friends, Matt Love and Judy Fleagle, published new books about the bridge. It all crescendoed in yesterday’s festivities. 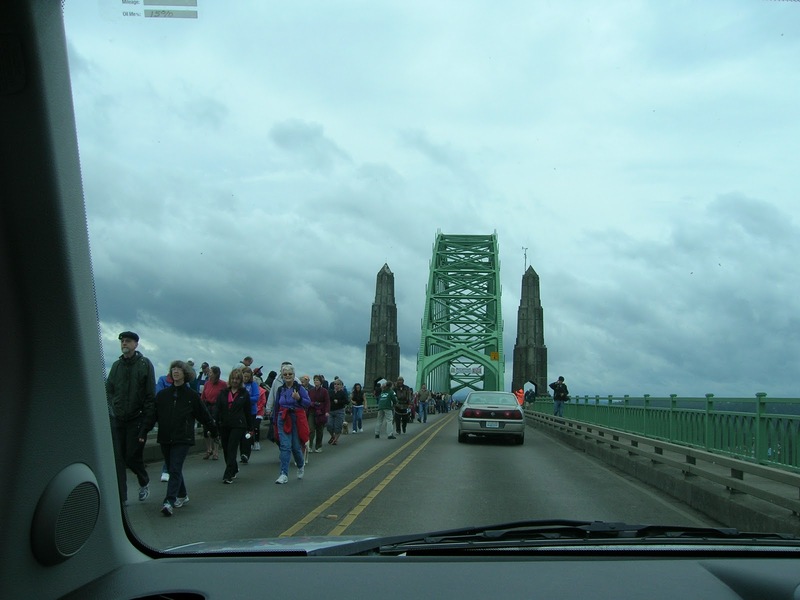 First, everyone was invited to walk across the bridge at noon. The Newport High School Marching Band led the way, followed by pedestrians, a fleet of 1930s-vintage vehicles, and bicycles. Some folks dressed ‘30s-style while most put on their fleece and slickers. Rain was coming. Fortunately, it held off until the bridge had been crossed. Under the bridge, folks gathered for a community picnic, complete with hot dogs, music, vendors and speeches. What a great feeling when people come together like this. It’s one of the things I love most about living on the Oregon Coast. My photos were shot while I was driving southbound across the bridge on the way home from church.The next time I cross the bridge, I’ll probably be looking around like a tourist. What’s the rush? By the way, it’s pronounced Ya-KWIN-na. We former Californians all have to learn that it’s not Spanish. It’s a native American name. Next Next post: It’s Great Being a Famous Author–or Is It?